Friday the 9th of March 2018 sees us take over Basement 45 for our first intimate party. 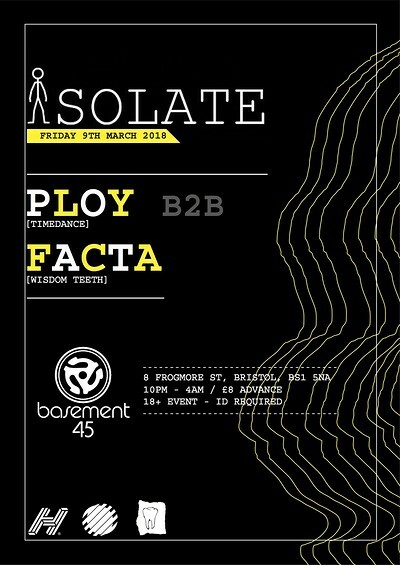 We are bringing you Bristol's Ploy to play B2B with Bristol's Facta. Yes, this is a proper Bristolian party! Ploy and Facta are two of the most unique artists out there. Their releases have been brought to us by some of the most forward thinking and genuinely incredible labels in the UK (Hessle, Tempa, Timedance, Wisdom Teeth NEED WE LIST MORE!?). Although these 2 seem like a match made in Heaven, this is the first time they have been booked to play B2B together. It's safe to say we are pretty excited.